Here, we have a great example of a parking lot that needs line striping, but can go without resurfacing for a few more years. early is crucial. Asphalt and concrete cracking can turn into potholes, which turn into larger potholes that damage the underlying layers of the pavement, requiring a more expensive full-depth repair to repair. Sagging or sloping from the constant pressure of passing traffic will become problematic as puddles consistently congregate in that area, thus accelerating the oxidation and erosion that water causes. Shallow potholes that are less than 1.5″ in depth can be repaired yourself using Quickrete, Road Rescue, or another pavement home-repair product. Anything with greater depth must be examined and repaired by an asphalt paving contractor or specialist. Hairline cracks, or cracks in a pavement under 1 inch in width, can usually be repaired yourself using a quick-fix formula from your local hardware store. However, if there are several cracks joined together in one area, this may be indicative of a greater problem that a professional asphalt contractor should address. 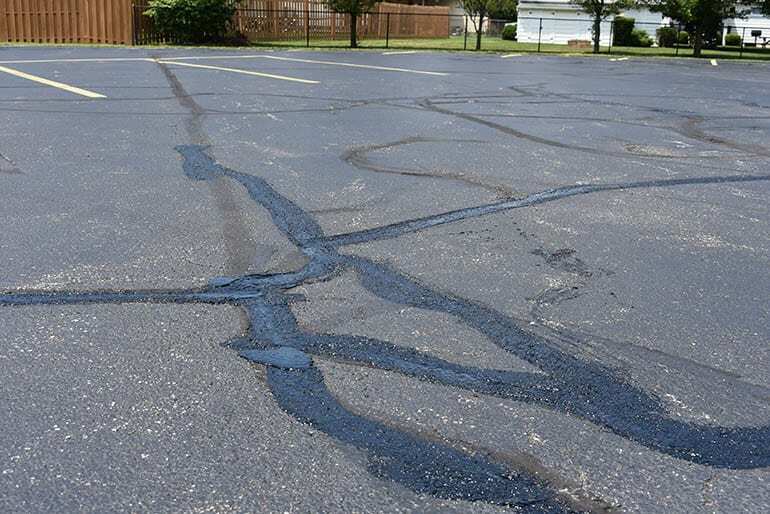 To minimize lasting damage to the integrity of your parking lot, cracks over 1 inch in width should be addressed by a professional asphalt contracting company for crack sealing services. These cracks are often deep and complex, creating avenues for undesirable moisture buildup within the foundation of the pavement, causing ever-expanding crumbling. 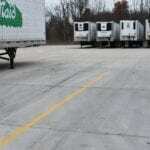 There are other problems besides facing growing costs that occur when you avoid restoring your parking lot as soon as possible. On top of the increased costs of fixing a crack versus a full-depth pothole repair, if a customer or visitor’s car is damaged by a neglected pothole, you maybe liable for the damages in a lawsuit. Customers may also avoid visiting your establishment at all if the asphalt or concrete is in a dismal state, and consequently take their business elsewhere. Properly addressed crack sealing looks like this until it cures into its familiar black tar-like substance. Cleanliness is important, too. A messy parking lot will invite more littering by pedestrians and visitors, and may eventually cause unappealing stains on the surface that must be removed with a power washer or a chemical treatment. 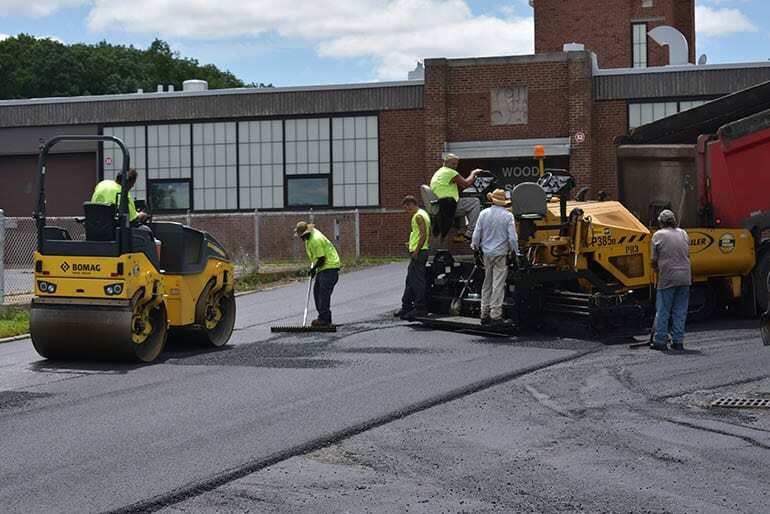 Once you’ve decided that it would be best for an asphalt contractor or paving professional for your parking lot repairs, it’s time to get a few estimates. First, determine your budget. Some asphalt repairs tasks like crack sealing and small pothole patching are relatively cheap. Look online for prices, or check out our asphalt paving costs page, to get some ballpark figures on what your final bill is going to look like. Then, search on your favorite search engine for “asphalt paving repairs” or “asphalt paving companies near me,” and browse through the results. Make sure they offer the services you need and have a professional online appearance. Many people avoid companies with poorly maintained websites for the fear that they might reflect that same work ethic into their paving jobs. Most paving companies take requests for paving services via and online submission form, a physical work request form, or via phone during business hours. A representative will take diligent notes on your request and the state of your property, and then pass on the information to a paving expert. An evaluation will then be arranged; usually an estimator will not require you to be present while he takes the necessary measurements to produce a quote, but they will always be willing to meet with you if you would prefer. Each company’s quote will vary, especially for larger jobs. Prices are dependent on a number of factors that are simply out of the estimator’s control. What you, as a customer, should do, is ask the questions necessary to ensure that you’re getting the longest lasting fix possible, and seek assurance you are choosing the most competent company that will work quickly, efficiently, and effectively. While price is always an important factor, you should balance price with quality. Once you choose the asphalt paving company you want to work with, it’s time to schedule the work. Pick days that will be of least convenience to your clients or customers. Most repair jobs can be completed in as little as one day, but will require additional time to cure. Clearly communicate any timing limitations with your paving contractors that are important, just in case the schedule runs into unforeseen circumstances. Building a good relationship with the paving contractors of your choice is a great way to negotiate better rates on jobs in the future. Our crew working through a resurfacing job- taking an asphalt lot that as in disrepair to one that is effectively brand new. pplicator. Alternatives including unmodified asphalts, unmodified emulsions, or chemically curing polymeric materials may be used. Potholes are patched or repaired in a similar way. Instead of using a tar-like sealant substance, potholes are patched using the same asphalt or concrete material that the surrounding pavement is made of. After the problem area has been thoroughly cleaned of vegetation and debris, asphalt or concrete is poured into the pothole and left to cure. The paving company will mark off the area and tell you how long it will take before the problem area will be accessible again. Asphalt damage can be stalled by regularly cleaning the surface of your pavement. Oil and grease stains caused by leaking vehicles can be removed using Trisodium Phosphate (TSP). One popular method is to leave kitty litter on the stain overnight, then apply TSP and scrub the area using a broom or brush. Be sure to never let anyone power wash the oil or grease; this will force the oil deeper into the pores of the asphalt, making it much more difficult to remove. Ridding the surface of your asphalt of stains, trash and leaves is a great way to ensure you maintain a strong curb appeal and discourage littering on your parking lot. Some stains can weaken the integrity of asphalt. Parking lot cleaning services are inexpensive and worthwhile. Sealcoating is a method of spraying a emulsion modifier on an asphalt pavement to increase traction and decrease the rate of oxidation the pavement takes on. Oxidation is the process of oxygen reacting with the carbon binds in your asphalt, making it more brittle and prone to damage. 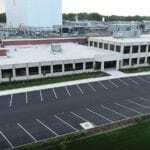 Sealcoating is a great way to dramatically increase the lifespan of your asphalt pavement. 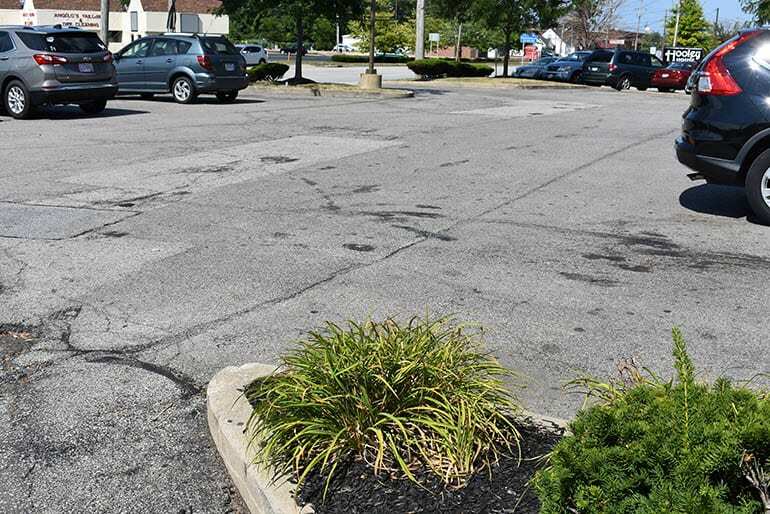 To get started on repairing your parking lot, contact our office by calling 440-975-8929, or email us at info@ohiopaving.com You can also use the contact form below.